Ecovillages have spent decades researching ways to unleash human creativity and solidarity in the design of social systems where both people and planet can thrive. GEN’s Ecovillage Education turns that research into tailor-made learning journeys for individuals, organisations and communities across the world. GEN Training of Trainers, a 5 day training with Kosha Joubert supported by Shane Sylvanspring, at Narara Ecovillage, Australia, June 5 – 9. Contact [email protected] for more information. Ecovillages Around the World & The Work of GEN, an evening presentation with Kosha Joubert at Earthsong Eco-neighbourhood, Ranui, Auckland, New Zealand, June 14 at 7 pm local time. 10 $ contribution, no registraton needed! The Power of Community – Ecovillage Living and Design, a 3 day training with Kosha Joubert supported by Thalea Tane and Robina McCurdy, at Tahawai Marae, Pakuranga, Auckland, New Zealand, June 15 – 17. Contact [email protected] for more information. GEN Training of Trainers, a 5 day training with Kosha Joubert supported by Macaco Tamerice, at Damanhur, Italy, July 19 – 23 – see https://ecovillage.org/our-work/education/tot/ for general information about the Training of Trainers workshop, and contact [email protected] to register your interest while we finalise details. Our passion is to facilitate hands-on, participatory and positive transformation. Our vision, a world where empowered citizens and communities design and implement their own pathways to a regenerative future. Together with some of the world’s most exciting laboratories for regenerative living, we offer learners direct experience of ecovillage living and a rich combination of local expertise and international certification. From finding inspiration and understanding the impact and nature of ecovillages, through applying ecovillage principles in the creative redesign of lifestyles and communities, to deepening skills and capacities needed to implement ecovillage innovations and solutions in every dimension of sustainability – we have the tools, expertise and experience. – Meet and learn from some of the world’s experts in regenerative living, either through attending trainings in ecovillages, or through GEN trainers travelling to you. – Experience immersive learning and direct exposure to ecovillage life in communities in every part of the world. 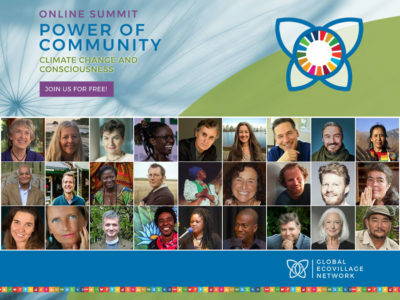 – Link up with learners, experts and ecovillages through our online platform and networks for GEN Students, Ambassadors, Trainers and Consultants. GEN Education actively collaborates with Ecovillages and Ecovillage Trainers around the world to deliver unique immersive learning experiences. Our certified trainings either take place in Ecovillages around the world, or through our expert trainers travelling to your group or organisation to deliver bespoke workshops. Together, learners, educators and ecovillages form a growing community of practice, sharing and spreading holistic and community-led action for regeneration around the world. If you are interested in exploring or becoming a member of our GEN Trainers collective, take a look at the GEN Trainers page. And if you want to learn more about our transformative curriculum for community-led change and ecovillage implementation, you will find more information about the GEN Learning Journey and upcoming trainings here. We know that each journey to ecovillage life is unique, so our offerings are modular, flexible, and designed to fit different contexts, aims and situations. Whether you want to dip in for an inspiring online session or set up a year-long process to create and implement a community resilience plan for your entire bioregion, we have something for you. GEN Trainings – Our flexible learning journey, delivered by expert ecovillage trainers from a great diversity of cultures and backgrounds.